At some point this season, once all the repairs from Hurricane Michael are completed at Billy Harrison Field House, they will hang another banner honoring the Gulf Coast State (Florida) College women's basketball program. This one, however, will have special meaning for the Commodores, in as much as it was their goal to not only win a national championship, but to honor the city that embraced them after the death of a player just a few weeks before the storm that devastated the Florida panhandle. Alexus Dye (6'0''-F) scored 14 points and grabbed 12 rebounds to earn tournament Most Valuable Player, and Gulf Coast captured its sixth national championship with a 68-62 victory over New Mexico Junior College on Saturday in the NJCAA Division I Women's Basketball National Championship at the Rip Griffin Center on the Lubbock Christian University campus. 'It means a lot because we've been through a lot and we've worked hard,' Dye said. 'I think we worked harder than any other team, and we do deserve this and we got it. We were very hyped, came out on a mission to win and we did it.' The Commodores (27-5) did it by using their length, 3-point shooting and tremendous defense to power past the Thunderbirds (29-6) in the first quarter and never look back, getting ahead 26-11. It is the third national championship for Gulf Coast in the last four years, but after all the adversity faced by the program over the last six months, it likely will mean the most. 'Just so happy for these kids,' head coach Roonie Scovel said. 'They just rose to the challenge, they accepted everything that happened. It's kind of amazing.' Just as amazing as the start the Commodores got off to in the game. Unlike the semifinal where they struggled out of the gate, the Commodores opened the game on fire, getting contributions from up and down the lineup. After the teams traded 3-pointers to open the game, Gulf Coast scored the next 15 points and finished on a 17-1 run to lead 20-4 with 2:43 to play in the opening stanza. Kincey, who had 18 points in the semifinal, picked up where she left off with a trey as part of her seven first-half points, and Naomi Mbandu (6'1''-SF-99) and Brittany Davis added treys as well during the run. This all came after the Commodores missed their first four shots but finished the quarter hitting 10 of their final 18 shots in the period. 'It was beautiful,' Scovel said. 'We knew there was TV, and we really stressed it before the game and even went in (the lockerroom) early and said make sure you don't get caught up with the TV and not play Gulf Coast basketball and not play together, because that's how we've won. And, man, we played together. It was beautiful in that first quarter.' 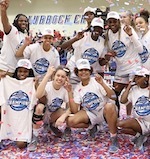 This was the fourth year the tournament has been held in Lubbock. The city has the contract for 2020 and 2021 as well. Gulf Coast State is located in Panama City, Florida. 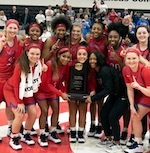 The school has won women's basketball championship in 2003, 2008, 2010, 2016, 2017 and now 2019. New Mexico JC is located in Hobbs, New Mexico. The Thunderbirds were seeking their first title.